A review of a game involving putting out fires wouldn’t be a review of a game involving putting out fires without some sort of nod to Sega’s classic Saturn extinguish-‘em-up Burning Rangers. So here it is: Burning Rangers was ace. 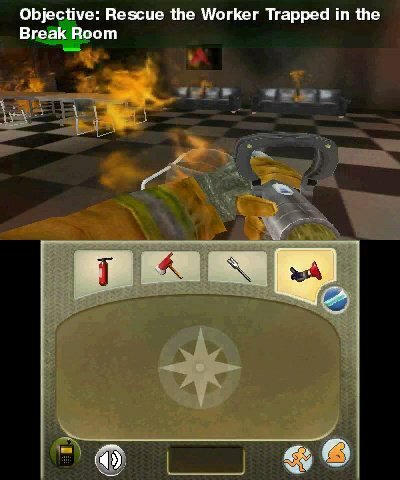 Real Heroes Firefighter 3D on the other hand, is not. Maybe that’s an unfair comparison, given that Reef Entertainment’s title is more of a simulation (and isn't set in space), but given the lack of firefighting games on the market, it’s the best we can do. In fact, the only recent game that we could feasibly compare this 3DS outing with would be the half-decent Wii version of the same game, which was released back in 2009. If we were to do that though, we’d have to say that while time heals many things, it turns out that a three year gap isn't enough to turn a passable game into an instant classic. In fact, things seem to have taken a turn for the worse during that time. 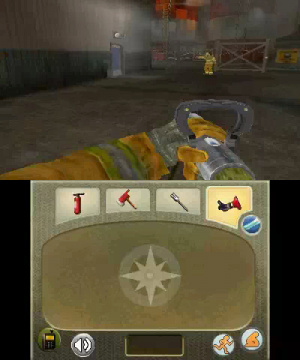 Real Heroes Firefighter 3D puts you in the shoes of a new member of a fire department, and teaches you the ropes via a tutorial mission which is dressed up as your character’s final firefighter exam. Once you’ve learnt how each piece of equipment works (which is generally a case of tapping the touch screen to equip it, and then pressing or holding the left shoulder button), you’re thrown into your first emergency call. By this point, the main problems with the game have already presented themselves and you’ll probably be having doubts about whether or not you want to continue. The first noticeable issue is with the control system. You turn with the stylus, while other movements are bound to the Circle Pad. This is a little unwieldy at first for what is purportedly an action game, but even when you get used to the basic idea, turning is so unbelievably slow that you never really feel at home. Instead, you feel as if you’re fighting with the control system when you should be focusing on the raging fires, collapsing ceilings, and unbelievably poor AI of non-playable characters. 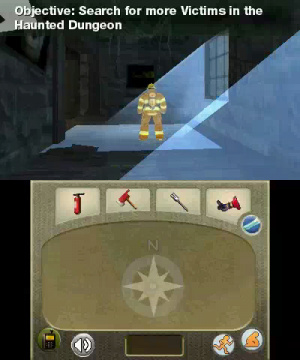 If you have to save someone during a mission, you can clear a street-sized gap in the fire for them to walk through, but they’ll decide that it’s too dangerous because a chair a few feet behind them has started to burn, or because a wall that’s a good distance in front of them (yet nowhere near their intended path) is ablaze. What they won’t do – ever – is choose the shortest possible path to an exit door, or tell you why they won't proceed. This means that any tactics you have for saving them generally come undone quite quickly, as you have to go back and play a bit of a guessing game to make them feel safe enough to continue. At times you really feel like you’re doing some heroic work. 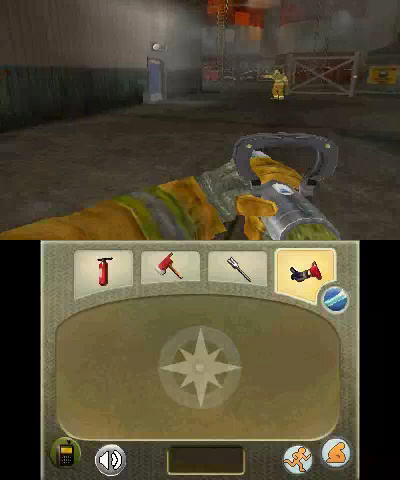 Prising open a door with your Halligan bar, before breaking your way through a pile of debris with your axe, picking up a downed colleague and dragging them to the nearest exit is almost a rewarding experience, but the real challenge comes when you’re one-on-one with the profession’s biggest enemy – fire itself. The game more or less represents fire in terms of square blocks. If a block isn’t burning but a block next to it is, it’ll eventually burst into flames. When you’re trying to put out a fire that has taken over an entire room, this presents a really tough challenge that’s almost akin to plate-spinning. You douse the flames in one corner of the space, take a minute or two to start extinguishing the sofa that’s ablaze, and turn back to find that the previously fire-free corner has started to burn again. Managing to keep a fire from spreading is challenging and – at times – engaging, although it starts to feel like a chore when you realise that when a room is on fire, the frame rate often drops down into the single digits. That’s surprising given how dated and blocky the game looks in general. 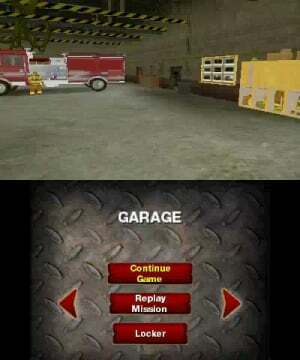 But nothing – and we mean nothing – puts a downer on Real Heroes Firefighter 3D as much as the constant failures that you suffer as a result of the game engine. In one early mission, you're told to find an alternative exit as the whole room has gone up and you’ve only a fire extinguisher for company. An arrow points towards a door, so you open it. By the time you find that there’s nothing behind that door other than a tiny office that doesn’t contain anything of use, the fire has spread around the doorway, and you can’t get back out without clearing a path. When you return on your next go-round – as your imminent failure is on the cards by now, just seconds after your extinguisher runs out of puff – you’ll see that there’s a set of stairs that could have been your saviour, were you not pointed in the exact opposite direction. Of all the things that could take a potentially exciting battle with one of nature’s most destructive elements and turn it into nothing but a massive bag of sighs, a dodgy compass wasn’t one that we would have thought of. To be honest, many players will fail that level three or four times and end up giving up altogether. We kind of wish that we had. Real Heroes Firefighter 3D suffers from below-par visuals and a game engine that feels nothing short of cheap. It isn't a patch on the Wii version - which wasn't outstanding to begin with - and any fun that the game provides disappears quickly in a puff of smoke thanks to annoyance after annoyance. With so many other titles out there, it really can’t be recommended. Another day, another terrible game. Wasn't there a Genesis or Saturn game based around fire fighting that was pretty good? Is this a retail title? I thought that maybe a better eShop would help remove some awful titles from the shelves, that could at least be cheaper to represent less of a loss. Is burning rangers the SEGA arcade fire fighting game? I have played the SEGA arcade fire fighting game and its fun, yet difficult. I don't believe this review at all because the Wii version was a great game. Seems like a very interesting concept. Too bad it didn't turn out well. @monkats Burning Rangers! What a classic. Shame this one doesn't live up to BR or the WiiWare game, but a great review @Ken!! Here's hoping we get a properly fun firefighting experience sooner rather than later! @SteveW After playing the Wii version myself way back when, and thinking it wasn't all that bad, I was surprised too by how weak the 3DS version is. @Mattiator - Good find. I'll back that! Oh wow, that's got to be the worst DS graphics I have seen on the 3DS. @zipmon - What Wiiware game? @KenB - The Wii game is actually one of my favorite Wii games, I tend to like unique games, Endless Ocean, etc... and simulations. If the 3DS version isn't as good as the Wii version then I won't bother, the Wii remote was perfect for this type of game. @SteveW Oops - I just meant "Wii"! @PoshSnivy, it's actually a retail game. Why even review this shovelware garbage? I've seen better lighting on the N64. The lighting and graphics look sickly! @Strongo9 To let people know that its shovelware garbage? Burning Rangers needs a HD update. I really loved that game but it needed a much more powerful system to run it than the Saturn. It wasn't a very pretty game, but it could have been. Plus full voice acting back in those days, coupled with some slick Anime scenes, top gameplay and score attack elements, bloody brilliant. "Objective: Search for victims in the Haunted Dungeon"
Another game not worth anyone's money. That's too bad, the idea has unexploited potential. @monkats As others have stated, Burning Rangers was the (great) Saturn game, but there were two 16-bit firefighting classic for the SNES - Ignition Factor and The Firemen (which got a decent sequel for the PSX). I appreciate the review. I was waiting on this game for some time and am sad to see it didn't turn out so well. I was worried about it because the release date kept getting moved, so this confirms my fears. Ah well. The concept is still fantastic and I wish it could have been pulled off well. I really want more FPS type games in general on the 3DS. We need more big budget games. Sometimes to experience something that is out of the ordinary or different from the mainstream games, one have to look beyond shortcomings. At least that's my usual approach when I feel the urge to buy something that looks quite like shovel ware. 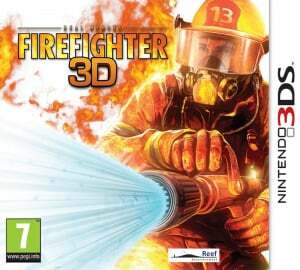 I've gone ahead and bought it online for a cheap prize, I has it's issues as the review outlines perfectly, but the concept of firefighting remains interesting and fun to do. @Hale-Bopp Reviews are just an opinion, so at the end I do not let myself get influenced to heavily. Played to many sub-par scored games in my life I really loved and to many so called "OMG 10/10 !" games I ended up not enjoying. Guess only I can be the judge for myself. Reviews are however a good indication what to expect and one can't deny certain shortcomings which are beyond a matter of opinion. Wanna know how HARD I laughed when I read this? I'll let you know: ALOT. What in the world are they doing in a haunted dungeon?! How can i update the cardridge version of the game so that i can open the door in the arcade?